People very often want to make a game either for fun or to sell it later. Very often small teams are made and begin the discussion about their new game. It has happened to me before many times and where I utterly disagreed with others, was in the subject of choosing a game engine. Most often, the programmer or programmers of the team decide they make their own game engine. I personally believe that the people in any game project should consider their goals. Is the goal to actually make a game? Because if it IS to make a game, then there is no reason for them to reinvent the wheel. There are tons of game engine out there that make the development of a game project much easier for the developers. Using a pre existing game engine makes the project easier, much faster to complete and keeps the spirit going since there is a relative good progress. Also using an existing game engine makes it almost sure that it has no major bugs, runs smoothly and is production ready anyway. I completely agree with people wanting to make their own engine, but then the goal is the game engine and not the game and thus no music compositor, modeler, texture artist, game designer etc are needed to be involved and in consequence loose interest cause there is actually nothing for them to do. But enough of my ranting. In conclusion there are many game engines for a team to consider using. I believe that a multiplatform solution is good enough for starting teams, because of the target audience their game can have. The iDevices and Android platforms especially are a good consideration since they have really a lot users and at the end most of the games on those devices are simple to make, thus they cost low and people will buy them, making the team motivated to move on to their next project and in consequence earning experience and possibly some fame. Unity Indie is free though it’s missing many features, while Unity Pro costs 1500$. If you want to develop for an iDevice or Android extra licenses must be bought. Stonetrip Shiva3D is commonly compared to Unity for their similarities in way of use and price. 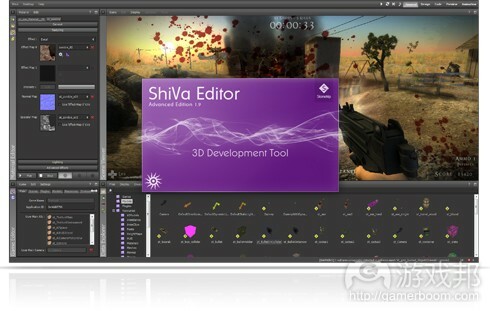 Shiva offers a well integrated editor just like Unity that everything is made from within. Shiva games can be published to Windows, Mac, Linux, iPhone, iPad, Android, Palm, PSP and Wii without complications as well. Shiva’s features are many just like anyone could expect from a modern game engine. Shiva PLE is free but to publish a game there are two licenses with very few differences. One at 170E while the other at 1500E. Graphically, Leadwerks Engine is state of the art. Leadwerks Engine comes with a WYSIWYG editor to design your scenes but also to program them in the now supporting LUA scripting language. In essence, Leadwerks Engine’s games can be programmed with any language since the engine is compiled as a DLL. The supported languages though are C#, C++ and was Blitzmax. A shame they drop support on Blitzmax though, since it was my favorite. Anyway A big bonus is that the API of Leadwerks Engine, is probably the most clean, easy to understand than everything I’ve seen so far. The resources might not be as many as in other game engines, but they are well enough to get you along. Worth of note is that Leadwerks Engine 3 is in development and I can’t wait. Leadwerks Engine 2 costs only 200E. I remember when Essenthel Engine was in early development and found it. I downloaded the demo and got amazed and after some years I am following it, I am still amazed by it’s progress. It support all common features out there and even more. Essenthel comes with an editor as all modern engines should and programming is done only in C++ unfortunately for me at least. The editor and the tools that come with Essenthel Engine are unfortunately very badly design and non intuitive. Essenthel games can also be published to any iDevice, which is a big plus. Licenses range from 150$ to 400,000$ depending on how much income you have and the amount of source codes you want of the engine. Truth is that the 1000$ license will suit most just fine, with great access to source codes. Although this engine is a bit obscured, GameCore 2.5, offers excellent graphics quality, deferred lighting, physics and one of the best editors and art pipeline I’ve seen. Importing a model and making a material for it is so straightforward. 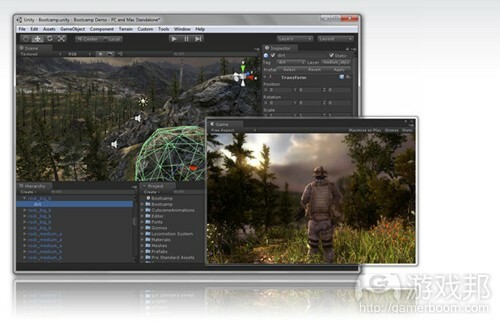 Games can be published to PC and Mac as well as on the Web. GameCore 2.5 has its own scripting language with a c-style syntax that’s easy to use. GameCore 2.5 Indie is free with some minor limitations, while the Pro version costs 1500$. S2 Engine HD is not yet released, but I felt like adding it in this list. From what it seems, S2Engine must be a great game engine featuring rich graphics, AI and fantastic editors. It costs 200E or 2000E if you want the C++ SDK. Construct game engine is one of those gems that you fall upon randomly. Not kidding. It’s a game engine for 2D games development and possible one of the easiest since it require little or no programming at all, since it is based on a visual, event driven system instead of pure programming, similar to that of the old Multimedia Fusion software. Development is done inside Construct’s editor and the engine is expandable through it’s plugin architecture. I really recommend you take a look at this game engine since most importantly its free and open-source. Gamemaker has been used to create many games. It’s a 2D game engine with many features in a well integrated editor. It has a visual event driven system but also support direct easy programming. The big plus of gamemaker is the great support, tutorials and real many plugins and addons that are out there to extend the engines capabilities. Gamemaker 8 costs only 25$, but there is also a limited free edition. Game Editor is another event driver game engine that is also open source. It has a nice and easy interface while there is the ability for multiplatform development, including Smartphones, Linux, iDevices and Mac. The documentation is good and there are also some tutorials to get you started. AGS is a game engine to create classic 2D point & click adventures. It has been used to create a LOT adventure games with my personal favorite to be 7 Days a Skeptic. The whole development takes place in the AGS editor where you create the scene, walkable & clickable areas as well as UI and events. To create a simple adventure, no programming is requires although programming is supported for more advanced games. Don’t expect anything great in quality but hey…this is a targeted to classic old style adventure games. Similar to AGS, Visionaire Adventure Studio is an engine to create point & click adventures. Compared to AGS though, Visionaire Studio is a bit cleaner and has a bit more features like PNG support (AGS doesn’t) but certainly much better graphical quality. It’s similar to AGS as in the visual event system and defining walkable and clickable areas. Visionaire Adventure Studio costs 35E. Unity是跨平台视频游戏引擎，其背后公司 Unity Technologies 5月21日（当地时间）在官方 博客宣布向小型独立工作室免费授权 Unity 游戏引擎基本版的 Android 和 iOS 插件. Unity 引擎从 2009 年开始一直就向新开发者提供免费版，但这仅限于 PC、Mac 和 Web. 作者：Gavalakis Vaggelis. 人们时常想要自行制作游戏，也经常会有人组建起小团队，讨论新游戏的制作.. 多数情况下，有不少团队程序员决定自行制作游戏引擎. 我个人认为，任何游戏项目的参与者都应当考虑他们的目标. 如果真得是为了制作游戏，那么就没必要费心费力重新制作游戏引擎. 目前有大量的游戏引擎可供使用，让开发者开发游戏项目的过程变得更为简单. 最近从一个技术沙龙活动中了解到一个游戏引擎（ construct2）， 这款引擎彻底地改变了游戏开发在我心目中的印象. 以前看过一些游戏开发的书籍，基本上都是从canvas，从坐标系讲起，再加上复杂地绘图编程，使得我不 敢对游戏开发有所奢望，更别提那些大制作. 但基于这款引擎让我在2个小时之内根据官方tutorial就能搞出一个看上去还不错的web游戏，并且不需要 一行代码，有点当年第一次接触ruby on rails时的震撼. 我是Seed游戏引擎的总架构师. 读者们可以快速切到第三部分和第四部分. 只有这两个部分是对问题的直接回答. 一、我认为， Unity3D将无可挽回的，或者说，势在必得的，成为接下来很多年内，世界移动领域游戏引擎市场霸主. 回顾历史，正如同咱们经历过一次又一次的互联网时代变革一样，x86，windows，Google，facebook，twitter，当一个具备一定规模的产品在一定领域达成霸主地位之后，其它的同类产品从技术积累上、推广成本上、对用户的掌握程度上等等方面的差距均会无可挽回的越拉越大. 这里有一个网址收集了关于JS游戏引擎开发库的一个列表，转过来. 关于使用JS和HTML5做的一些小游戏，可参见《HTML5 小游戏展示》. Name Latest Release License Type Notes The Render Engine 1.5.3 MIT 跨浏览器; 大规模 API; 开源. 2 gameQuery 0.5.1 CC BY-SA 2.5 和 jQuery 一起使用 gTile 0.0.1 Tile based. 项目站点： http://www.andengine.org. 项目地址： http://code.google.com/p/andengine. 示例地址： http://code.google.com/p/andengineexamples. AndEngine 基于libGDX框架开发，使用OpenGL ES进行图形绘制. Godot 游戏引擎在 MIT 许可证下 开源， 代码托管在 Github 上. Godot 是一个全新开发的游戏引擎，其功能集类似知名的跨平台游戏引擎 Unity，可用于开发 PC、主机、移动和 Web 游戏. 开发者 声称引擎的 2D 和动画支持要强于 Unity，表示在功能和特性上没有其它开源游戏引擎能相媲美.